Start a conversation. Post a thread to our forums. (You don’t have to be a member to register and participate there.) Members, make a thread for yourself in the Member News forum to tell us what you’re up to. Chat in the shoutbox. Add a member’s book to our Goodreads shelf, or start a conversation there. The more members and future members we have adding their voices, the better. Write a blog post. (Yep, this thing I’m posting on right now.) Members, we’re always looking for blog posts on any aspect of the writing life. Full guidelines are here, and remember, we’re also happy to take reprints from your own blog/journal. Signal boost. This is something everyone can do. Retweeting or reblogging good stuff from our feeds takes just seconds, and signal boosting never hurts. We’re on Twitter as @furwritersguild. Help keep markets (and our website) updated. Here’s another one everyone can do. If you run across a publication that might be open to furry-themed fiction or just one you think might be of interest to our writers generally, post it in the Calls for Submissions thread or email me at furwritersguild at gmail. If it’s specific enough to furry writing, I’ll add it to our website’s market pages. Same goes for conbooks — if you know of a convention coming up that’s open to conbook submissions but isn’t yet listed on our Conbooks page, just make a post or send an email, and I’ll get it added ASAP. And if you have any other resources to add to our website, anything from a link to a story generator or writing software or a great writing blog, just let me know. I want to keep adding as many good resources to our website as I can. Host a panel. Members, consider submitting a FWG-themed panel to cons you’re attending. This could be an informational panel about the guild, a group reading with several FWG members participating, an informal meet-and-greet, or some combination. Or, if you’re already doing other panels, mention in your introduction that you’re an FWG member. We’ve gotten a lot of help from just that type of simple, casual word-of-mouth advertising. Help with advertising. If you know of an advertising opportunity, especially free or low cost, drop me a line. Add one of our images to your website — or design us something new. Buy our anthology. In print or ebook. Or buy a copy as a gift. Already read it? Write a review on Rabbit Valley or Goodreads (or both, or wherever else). Profits from the anthology’s sales directly benefit the guild, and reviews help visibility. Make a donation. If you want to know where your money’s going, we have a treasury thread that keeps things transparent. Donations help fund our website; advertising, printing, and postage costs; and current and future projects like the Cóyotl Awards and anthologies. And as a bonus #11, check out our volunteer wish list for more info on specific items where you can lend your skills. 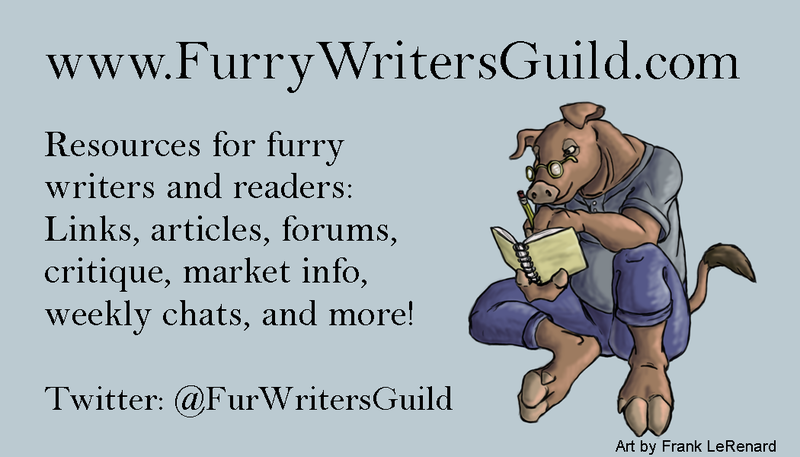 Thank you to all our members and supporters who help make the FWG such a great resource for furry writers! What Can Goodreads Do For Me? Launched in 2007 and acquired by Amazon in 2013, Goodreads is a social network for readers and writers. Like Facebook, but for books. Bookbook, if you will. Users can search for books in the extensive database, for the most part user-created, and add them to their ‘shelves’. If the book you’re after isn’t listed, you can do your part by adding it. There are three default bookshelves, ‘Want to Read’, ‘Currently Reading’, and ‘Read’, but you can add as many custom shelves as you like; ‘Crime’, for example, or ‘Non-fiction’, or perhaps ‘Comfort Reads’ or ‘Really Bad Books’. It’s strangely satisfying to have a record of what you’ve read, with statistics and word clouds for your shelves. If you feel the need to gameify your reading experience, you can sign up for a challenge like ‘read 50 books in a year’. Every time you log in, Goodreads will tell you how many books you’ve got through and how far behind or ahead of schedule you are. Other bits of fun include literary trivia questions, polls, and daily quotes from writers. As well as keeping track of what you’ve read, you can follow your friends to see what they’re reading and reviewing, and leave comments. I’ve had many a Goodreads discussion over books I might otherwise never have suspected someone I know had also read. Looking at your friends’ shelves is one way to find new reading matter, but there are also communities for fans of particular genres, as well as for readers from one particular area or with a common interest. There’s a reasonably active furry community, Furries!, as well as the more general Anthro Fiction group. Goodreads also offers recommendations based on what you’ve read, and lists of the top books in a particular category, which can be as broad as ‘Best Young Adult Books’ or as specific as ‘M/M Cat-Shifters, Feline Aliens, and Other Feline Humanoids’. Here’s where things get interesting. Once you’re signed up as a Goodreads Author, you have a number of options for promoting your works and interacting with your readership, most of which will cost you nothing but time. Learn more about your readers and how your books are doing by visiting the page for one of your books. Here you can see who’s read it, who’s marked it as To Read, and any ratings and reviews. Who are those people? What else are they reading? These could be valuable clues to help your marketing strategy. See whether your book is featured on any lists, and what else is on there. Add it to some lists yourself (sneaky!). Goodreads offers a number of configurable widgets, so you can show off your reviews on your own website, or add a button next to your book so passers-by can add it to their To Read list. They even provide the API if you really want to get down and dirty. And if you don’t mind giving away something for nothing, it doesn’t take much more effort to upload a free sample of your work as an ebook.